Blocking Peptide Zu diesem Produkt passt das Blocking Peptide ABIN975792. 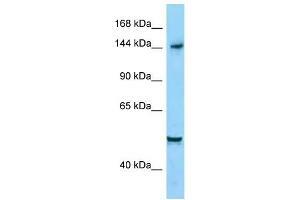 Produktmerkmale This is a rabbit polyclonal antibody against DIAPH1. It was validated on Western Blot. Hintergrund This gene is a homolog of the Drosophila diaphanous gene, and has been linked to autosomal dominant, fully penetrant, nonsyndromic sensorineural progressive low-frequency hearing loss. Actin polymerization involves proteins known to interact with diaphanous protein in Drosophila and mouse. It has therefore been speculated that this gene may have a role in the regulation of actin polymerization in hair cells of the inner ear. Alternatively spliced transcript variants encoding distinct isoforms have been found for this gene.